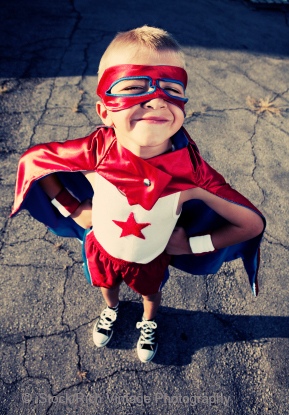 If you were to unleash your inner superhero, what color of cape would you wear? Not into capes? After all, they can be a hazard around escalators and revolving doors, then how about a costume or mask? Like me, you may have noticed that superheroes are back in vogue. A plethora (great word since it’s definition of “superabundance” is so fitting) of superhero themes are making their way to the big screen. More notably though, there is a whole underground movement of real life superheroes that is going strong. These are everyday heroes, regular people who dedicate time to fight crime, to perform civic duties in their neighborhoods, or to do charity work or other good deeds (often without the desire for recognition, hence the need for superhero gear). What is it about superheroes that draws us in? Surely the appeal is partly about the double-life of a seemingly regular person behind the mask. Mostly though, there’s a desire within many of us to make a difference. A superhero theme is an apt way to convey a “power of one” message to explore sustainable, or what I call “smart” business practices, eco-leadership roles, and design responsibility. Plus, it’s fascinating to see how superhero trends parallel historical events and design movements. Superheroes first appeared in comic art form in the 1930’s following Expressionism, Futurism, and Constructivism. These were times of profound change, in which design was often used to express political or philosophical ideals or manifestos. It’s no coincidence that we see design manifestos emerging again with the sustainable design revolution, with a new generation of “citizen designers” who are working for global change. Citizen designers strive to innovate, inform, or inspire change to make life better via thoughtful, responsible design: design for global change. These designers go beyond making eye candy or stuff, and are redefining “good” design. It’s design that gives back to the community, or design that raises awareness or fosters social change. In other words, it connects to a growing contingent of designers who are using their “powers” for good. Some examples of world-changing design include Hippo Rollers that allow people in developing countries to transport gallons of water in a rolling barrel on the ground instead of hauling containers on their heads or backs. This smart, yet simple strategy greatly reduces the burden of water collection, freeing women and children to have more time for education and domestic or business pursuits. Another water related design solution includes the Life Straw, a small portable water filter that purifies water instantly as the user sips contaminated water (nearly half of the world’s poor are affected by waterborne illness and diseases). Most of us are familiar with the OXO Good Grips line of kitchen and garden products that are a pleasure to use since they are so comfortable. Originally this line was created to help those who suffer from arthritis, yet the product line’s universal usability features prove that thoughtful design solutions are welcome by all. There is a growing sense of appreciation for this vital aspect of design, and it is flourishing around the globe. Judging by these recent book releases, change is definitely afoot: Design for the Greater Good, Design Revolution: 100 Products that Empower People, The Big Book of Green Design, Do Good Design: How Designers Can Change the World, and Worldchanging. Even design award shows are recognizing these contributions, with new categories that showcase sustainable design and socially responsible design. Back to that cape question. Are you a cause designer at heart and want to use your design skills to make a difference? If so, join us!